Dangerous air-pollution levels in Delhi illustrate why multifactorial pollution must not be ignored at the UN Climate Change Conference in Paris, says Dr Anthony Horton. A recent article published in the Atmospheric Environment journal has illustrated why air pollution is a multifactorial issue that shouldn’t be ignored amongst the excitement and anticipation of the United Nations Climate Change Conference in Paris, commencing on 30 November. Prashant Kumar from the University of Surrey Faculty of Engineering and Physical Sciences led a team of researchers in a study that highlighted the importance of unregulated and unaccounted primary pollution sources (those that emit pollution directly into the air) in and around Delhi. In addition, the research discussed the challenges associated with developing effective air pollution control strategies. This year, Delhi has been ranked fifth out of the 32 megacities in the world in terms of population (approximately 26 million). In addition to unregulated and accounted pollution sources within Delhi, there are a number of other factors that contribute to air pollution in the city. Sources say in areas surrounding the perimeter of Delhi (in which the city’s regulations don’t apply), geography and regional meteorology all contribute to the reality of air pollution. 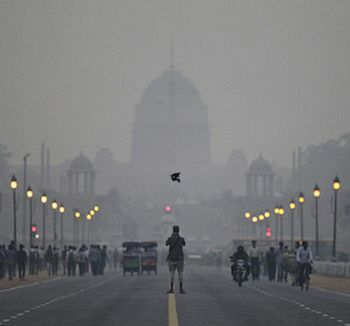 Regional meteorology results in a number of phenomena that influence Delhi’s air pollution. These include: high winds and dusty conditions in summer emphasised by low relative humidity conditions, which enhance the resuspension of particles; episodic dust transport events from nearby areas; background ozone concentrations and long range transport of precursor emissions from subcontinental and intercontinental sources. As a result of Delhi’s geography, air – sometimes more polluted than in Delhi itself – moves into the city from surrounding areas. Being land locked, there are few opportunities to flush polluted air out or to replace it with cleaner air from maritime regions — this puts Delhi at a distinct disadvantage. Delhi shares this characteristic with growing megacities such as Tehran and Cairo in which urban growth is increasingly heterogeneous and sometimes unplanned. In contrast, megacities close to the coast benefit from sea breezes that exchange maritime and urban air once each day. Urban environments typically have a diverse range of co-existing pollution sources and it is important to understand their location and emission intensity in order to develop abatement measures and for predictive and forecasting purposes. In developing countries, such knowledge is reasonable but there is a general lack of high quality, spatially disaggregated, primary emissions inventories for many megacities including Delhi. As a result, emissions factors become inadequate or outdated and unaccounted and unregulated sources are often left out of inventories. Emission inventory and source apportionment studies typically include emissions from on road vehicles, power plants and the resuspension of particulates. However, city specific sources are sometimes left out. Important sources for Delhi include brick kilns fuelled by raw wood, agricultural waste or poor quality coal, the roadside burning of organic and plastic waste, the unintentional burning of municipal solid waste at landfills and construction activities. Cooking by the burning of solid biomass or cow dung is another important but poorly quantified air pollution source that emits gaseous and particulate pollutants. Direct evidence of the incomplete combustion of biomass and soot/organic carbon emissions is seen in the black colour of the “Chulla cook stove”. Diesel generators for temporary power generation have been considered in some emissions inventories in India such as the Six Cities Program of the Central Pollution Control Board in India. In areas of poor power network resilience or undersupply, diesel generators are particularly important. In terms of Delhi, diesel generators become very important in extreme summer and winter weather conditions. They tend to be fuelled by poorer quality diesel with a high sulphur content and may not be regularly serviced. Their emissions (including nitrogen oxides, carbon monoxide, hydrocarbons, particulates and smoke) may also not be checked by regulators. Traffic congestion is a ubiquitous air pollution source in cities and in Delhi it is emphasised by the very high density activities and limited infrastructure in the city. Emissions at traffic intersections are made worse by poor exhaust control measures and the heterogeneous nature of the fleet. Unregulated small industries use a variety of energy sources (for example, biomass, plastic and crude oil) that are often not accounted for in existing inventories. A number of small and household industries moved away from Delhi city following the implementation of the Indian Supreme Court orders in 1996, however they are still included in the baseline emissions for the city. The majority of the brick kilns are located outside Delhi city but many of them are upwind so they can still make a significant contribution to the air pollution load of the city. A variety of building heights in the densely built up area of Delhi restricts the dispersion of pollutants and therefore the liveability of the city. The residential floor area per person in Delhi is 3.31 square metres, compared to 21.85 square meters in Beijing. The mean diurnal range of Delhi’s ambient temperature has also been steadily decreasing due to urban heat island effects. Under low wind conditions which commonly prevail in Delhi, external polluted air can be drawn into the city. Want to get the facts on climate change? Subscribe to IA for just $5.